From the first day, I met this man through a mutual friend, when he was driving the 'My Nigeria Project' I knew I had met with an uncommon Nigerian. 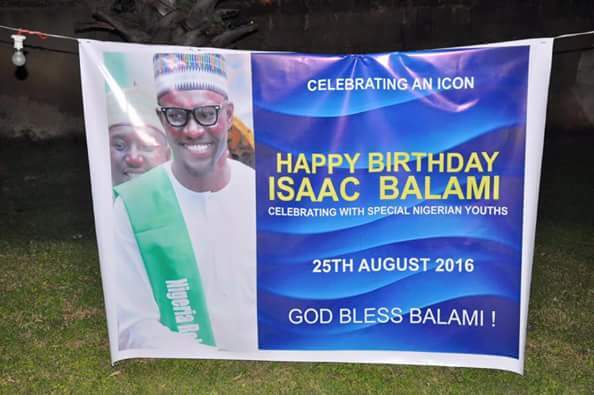 Just 3 years and counting he has done several projects through his Isaac Balami foundation, Nigeria Rebirth project with the Labour Room Reality TV show, an Aviation servicing company and more. Then most recently, actually on my birthday eve on July 4 at his magnificent Balami Dream Hub, he told me how he used to evacuate waste from underground soak-away tanks, then painted to survive and more. 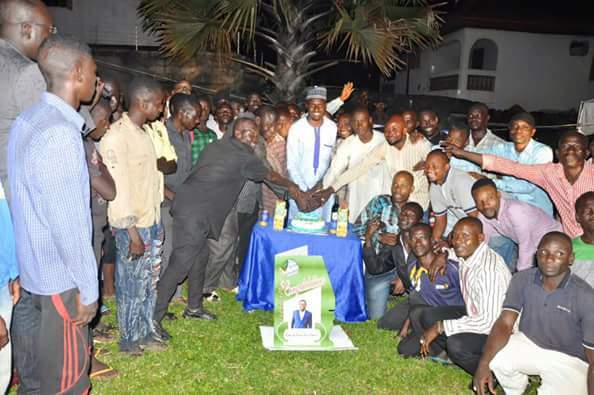 True to his word, he celebrated his birthday with his former constituents - painters, masons, labourers and day jobbers in Abuja. Here are some pictures and what he wrote about it on his Facebook page. my birthday is over but I feel a bit of my story needs to be revealed to you today. Every 25th of August is not just to celebrate my birthday but a day to reflect over the past and revel in the present. 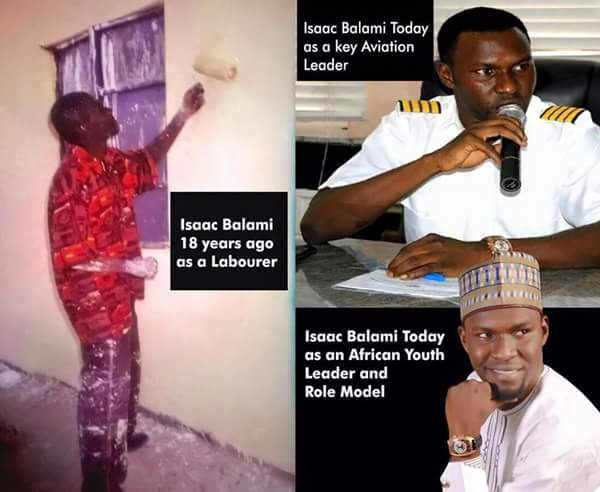 Who would have thought that a mere painter just 18 years ago could become the national president of the Association of Nigerian Pilots and Engineers? 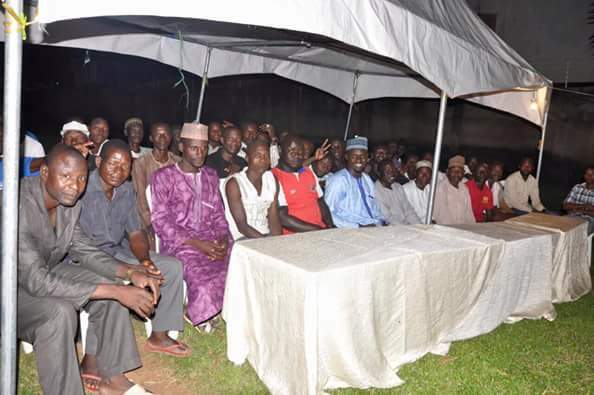 Who would have thought that an ordinary mason just 16 years ago could become the past spokesperson of Trade Union Congress of Nigeria?Who would have thought that a filthy and stenchy soak-away evacuator from the North-Eastern part of Nigeria could become the president of Arewa youth consultative forum? Who would have thought that a man who could hardly afford a daily meal could cater for over 500 widows and sponsor nearly 500 children in school as a commitment from a foundation he owns? Who would have thought that a helpless man who faced a lot of religious and ethnic discrimination would be the founder of Nigeria Rebirth Project? : its unveiling had a convergence of 66 ambassadors of nations and well over 20 state governors' wives. Who would have thought that a young man whose fellow students refer to as Mai suya could build BD Hub, the largest hub in Africa. I could count on the seemingly odd and unfavourable pebbles life threw at me as a young man. But I tell you something friends, God raised me up! God raised me above those stormy seas. If you are looking for the man that should have amounted to nothing either by hard work or background, it is me! But God in His amazing grace brought me where I am today and I will not lose touch with that fact. So on the 25th of August being my birthday, I had the singular honor and privilege to celebrate with my friends once again, just like we have always done over the years. The ones doing the dirty and menial jobs in Abuja. The ones always reminding me of my past. The masons, carpenters, diggers, painters et al. The ones I could have looked down on because of my present status in the society. Then I discovered something. I am in no way better than them. It was just God that made my life this enviable. A few of my facebook friends who do not know me too well think I was born with silver spoon. They accuse me of trying to inspire them because I had a very smooth background. Let me reiterate once again that God is the reason for my success story. Not my academic prowess or intellectual property. So I took time to hang out with these great men after their day's job. We gisted, danced, cut the cake, ate and drank in merriment. They got motivated by me and I in turn got inspired by them. What a symbiotic atmosphere that was! God willing, I wish to do this for the rest of my life. Forgetting them is forgetting my life and forgetting my life is simply forgetting God who makes all things possible. I dread that day and I pray it does not come. This is a clarion call on every great dreamer out there, most especially the hustlers in these hard economic times. Do not give up! Do not give in! Keep keeping on! If God could place me this high, He will do the same for you, even more, only if you will not stop believing. Friends, celebrate these special people with me even as you celebrate me. God bless you all. N.B: The painter in the picture is me. It was taken some 18 years back. This is one reason why You must not give up but trust God for Your Dream." Awesome, right? Some of us have such inspiring stories, may we share please?